Plus Size Kitten: Corus Hotel Branded Fragrances & Cosmetics Warehouse Sales Again! 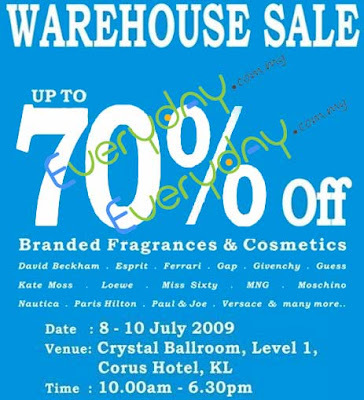 Corus Hotel Branded Fragrances & Cosmetics Warehouse Sales Again! saving myself up to ravage Estee Lauder Warehouse Sales! not going to this one, bye bye Corus Sales@! 1. Are you interested in any of the brands/perfume offered in this sale? 2. Are you willing to stand for hours just to get in/pay in this warehouse sales? 3. Are you ok with crowds on the first day? 4. Are u coming to buy to earn some extra moolah from ebaying these perfumes? To go on 1st day or following days? which better? 1. Are you a bargain hunter? - if you are u might consider going on first day & last day (for chances of price reduction). 2. No I just want to browse. - then go on any days u like, avoid 1st day if possible bcoz it's ussually crowded like mad. 3. I prefer no Q or less waiting time. 4. I want to get the best sets/items/limited edition perfumes! - go early, buy early and get out early! usually for this sales it's MAD on the 1st opening day. 5. I am here to make extra moolah! Then consider going on first day opening you might find some nice sale items worthy of making extra moolah. Last day is great as well since they might slash prices. *u may refer to my countless experience report by clicking on the above links where I go mostly on first days first opening. Oh dear....all I want is just to go see if they have the nice Paul&Joe bags...not necessarily like the trolley bag you got, but just any P&J bags......so crazy over bags, just any bags from cosmetic brands...totes, cosmetic pouches, etc... but think should save money for EL hor...?? drop by early go see, usually within first 10-15mins will kena sapu..
Asu: if u love paris hilton, should go check it out :) however the 1st day is very crazy with long Q to go in, come out n pay. So hope u r comfortable with that risk. Cai: NO SELF CONTROL BABE! ESTEE LAUDER! and ANNA SUI JUST OVER! so, no personal shopping for the rest of us, mere mortal eh? i tell you ah, you thing from jme is almost like "kiam-chai" already loh. next time, if i happened to meet hurley, i'll pass to him. don't forget yah, if you ever come across Fahrenheit to keep one for me, i just wanna try. cai: lol!! think about BB and MAC! forget P&J! uncle frog: ok boss, specially get for u if u see it! wah, your pic now so glamour one. gee, thanks for STILL remembering me. argghhh.. too many good sales and no money to spend as much. uncle frog: wahseh SACASSTICNYAAA!!!! just very busy lah... my hobby becoming my work life now sigh. miu..need ur advice...i decide to going this sale..but must be crowded giler..huhu..1st day or 2nd day is better to go? by car or Lrt? pening2..
for this sales alwiz crowded gila on 1st day. But i do hope it kurang crowd this time, since so many warehouse sales is around, side by side, one after another. I am really amazed ppl still can shop! so let's do hope not many ppl crowd for this sale on 1st day. 2nd day would be much better dearie but avoid lunch crowd. By car u will need pay parking, by lrt, u need jalan and if u buy lotsa stuffs..gona be tiring to carry. If car, u will penang to park if too many ppl go. My advice is think through it, see which day/time you're comfortable. Things very unpredictable for warehouse sales. this corus/armada sales alwiz ada punya.. i believe end of this year goin to come out again..
is it true that no bags allowed?handbag pn xleh lgsg ke? for this warehouse sale, they will seal your handbags up and tie it, then only u can bring it in.